Not only that, a spigot is also a necessity for batch brewing in any very large vessel. But not any spigot will do for a safe, convenient, successful brew. Just as with any ingredient, quality brewing suppies make for a superior experience. Spigots for continuous brewing systems should always be easy to clean and disassemble. Check the features and measurements for each spigot in the product description to see if they will fit your vessel. 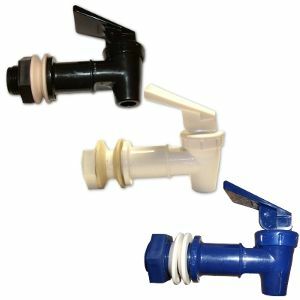 Brew Safe Plastic Spigot - American Made brew-safe plastic spigots come in three colors and feature simple and quick installation and removal. Our professional-grade plastic spigots are made from the same safe materials used for brewing vessels in the wine, beer, and Kombucha industries. Brew Safe Stainless Steel Spigot - Stainless steel spigots offer a more refined designer look and are made from 304 grade stainless steel, the only metal that is safe to use with acidic brews like Kombucha. While our plastic spigots are 100% brew safe, some Kombucha brewers prefer to use stainless steel spigots and keep plastic use to a minimum when handling Kombucha. Brew Safe Wood Spigot - Our brew-safe wood and cork spigots are a great option for those who want to choose a material that is 100% natural. And every spigot now comes with a FREE spigot brush, which can be used to dislodge blockages inside the spigot while it is still assembled and attached to the brewer, making maintenance even easier! We recommend trying different types of spigots to find the one that you like best. For more information on selecting, installing, and caring for spigots, see below. A Kombucha spigot may seem like an insignificant concern, but it’s actually quite important. Many consumer-grade spigots that come installed on widely available beverage dispensers aren’t actually brew-safe spigots because they are made with toxic materials not meant to interact with the high acidity of Kombucha. Even if the spigot does not have the coating on the inside, the Kombucha dispensing through the spout has caused the coating on the spout to wear into the brew and chip off as well. Additionally, these spigots are made from a lower grade plastic, more translucent and white, which was never intended to be submersed in very acidic liquid like Kombucha. When taking charge of gut health by becoming a continuous brewer, the last thing one wants to do is leech toxins into the brew. 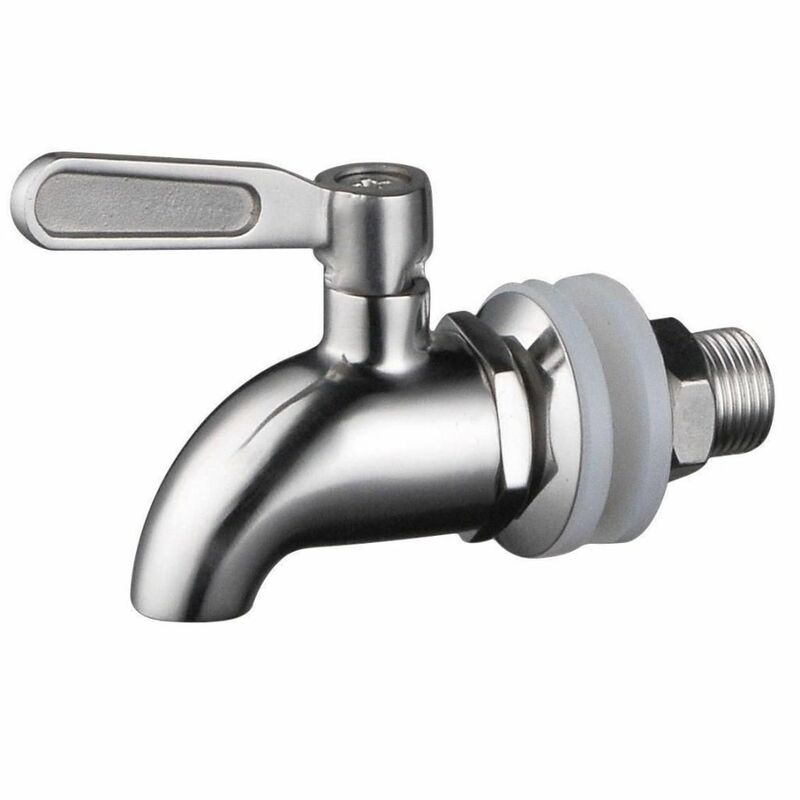 Always look for brew-safe spigots that are made of wood, stainless steel, or professional-grade plastic. The brew-safe spigot should feature nuts and washers that are corrosion-resistant and can be easily taken apart for cleaning. Spigots make it easy to bottle Kombucha or simply pour into a glass to enjoy straight-up. Professional-grade plastic features an excellent flow rate, and the stainless steel is even faster in this regard, while wood spigots do have a bit of a slower flow rate, but each of these materials is effective and safe to use with Kombucha. Before starting your initial brew in the new vessel, it’s important to check and prepare the spigot. Attach the brew-safe spigot to the vessel properly and then fill it with enough water so that the spigot is completely covered. Wait at least an hour, up to 24 hours, to check for any leaks in the assembly. If there are leaks when testing the plastic or stainless steel spigots, simply empty the vessel, unscrew the spigot, adjust the washers, and reattach. Usually flipping the washers helps fix any issues. Keep testing until no leaks occur. 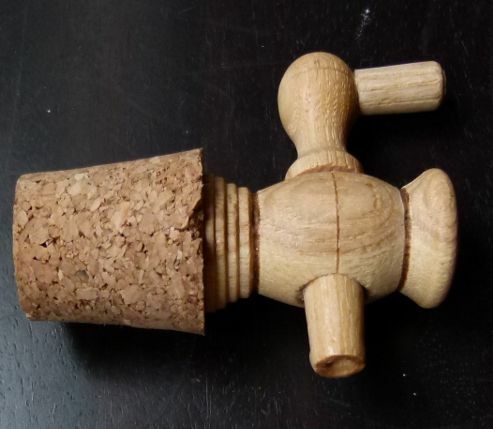 If using the wood spigot, the cork lining requires soaking up to 24 hours before the material expands enough to create a seal within the hole, so be patient as a little leaking is normal at first. Test the spigot’s flow as well. If starting with a very clean vessel, all that may be required is a hot water rinse to be ready to brew. If you are particularly concerned with contamination, swish about a cup of Kombucha vinegar or pasteurized vinegar like white vinegar (NEVER raw!!) around to coat every surface within the vessel. This “cures” the inside of the vessel, creating a healthy environment for the fermentation process to begin. Dump this liquid out. Now it’s ready! It’s very common for collections of yeast or bits of SCOBY to collect inside the spigot. Rather than taking it apart every time this happens, simply dislodge them with the FREE spigot brush included with every KKamp spigot, or if you didn’t get a spigot from us try using a toothpick or something similar to dislodge the blockage. To clean Kombucha spigots, simply take them apart and remove them from the vessel, then run under clean, hot water. If the brew molded, it may be necessary to use soap or even bleach to remove any residue prior to restarting the brew. One of the best parts of continuous brewing is the convenience. The average homebrewer might only need to disassemble and clean everything once or twice per year, depending on the brewing environment and personal preference. Maintenance includes removing the SCOBYs and trimming them down, decanting the liquid, cleaning the vessel and spigot, and then restarting the brew again. More instructions on maintaining a Continuous Brew can be found in our downloadable Complete Handbook pdf or (covered much more extensively) in The Big Book of Kombucha available in both Hardcover and Paperback. Why Buy Brew-Safe Spigots and other Continuous Brew supplies from Kombucha Kamp? Kombucha Kamp is a highly trusted online source of information about Kombucha including countless tips and step-by-step tutorials. Then when you're ready to brew, we offer the highest-quality Kombucha brewing supplies for every step of the process, including fresh, full sized, potent Kombucha, JUN, water kefir, and milk kefir cultures as well as Continuous Brew. If you’re ready to order but have questions about which products are right for you, please reach out by email or phone--we are happy to help!